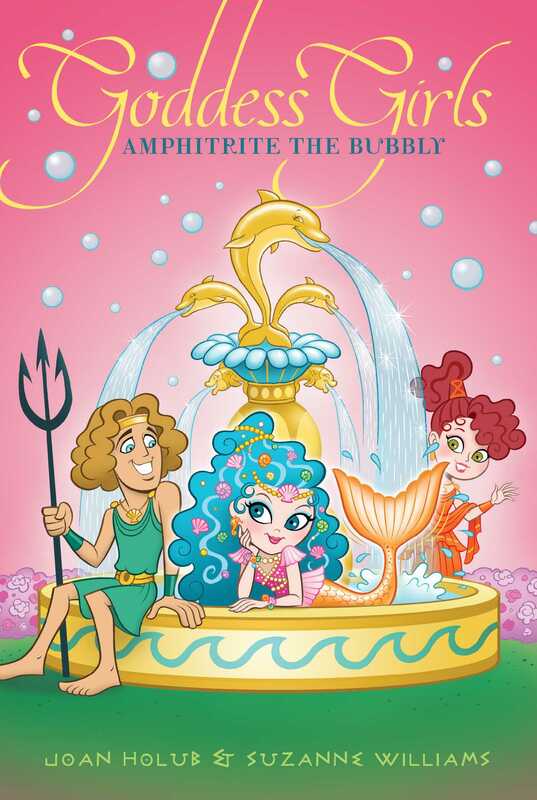 A new mergirl shows up at Mount Olympus Academy—and Poseidon just might be her perfect match in this seventeenth Goddess Girls adventure. Amphitrite is a mergirl with a big crush on Poseidon—but will his quirks make her fall out of like? WHOOSH! SWISHING HER TAIL UP and down, a mermaid named Amphitrite sliced through the bright blue waters of the glittering Aegean Sea. Her arms moved in quick, smooth strokes as she left the cave she called home. She was off on a serious mission—to track down her missing little sister. Thin rays of pale morning sunlight filtered down through the water above her to sparkle off the golden scales of her tail and throw highlights into her flowing turquoise hair. Sea grass brushed against her now and then, and eels peeked out curiously as she swam past. Her eyes searched the orange and pink branches of the coral reef below. But all she saw was her own shadow moving over it. “Halia! Halia, where are you?” Amphitrite called out frantically. A trail of iridescent bubbles trilled from her lips as she spoke. She wasn’t alone in her search. Her sister Thetis was swimming right in front of her. Both mergirls were twelve years old. Although they were twins, the two of them looked nothing alike. Mediterranean Undersea Middle School, she meant. Their school had taken its name from a larger sea just south of the Aegean. And today was Monday, a school day. “Yeah, but she’s never been lost for this long,” Amphitrite fretted. Halia had gone shell-collecting yesterday and hadn’t returned. With fifty mergirls in their busy family, her absence hadn’t been noticed until a few minutes ago. Officially, their family were all Nereids, the name for merpeople that lived in saltwater seas. They also had many cousins, though. Their Naiad cousins dwelled in freshwater seas, the Dryads in trees, the Oceanides in rain clouds, and the Lampiades in the Underworld. As the two oldest mergirls in the Nereid family, Amphitrite and Thetis were responsible for keeping track of their little sisters. Which was like herding the great colonies of seals that their dad, Nereus, was in charge of. So difficult, it was practically impossible! “The last time anyone saw Halia was in Shipwreck Bay. Let’s try there,” Thetis called back to her. The speed with which she shot forward indicated that she was more worried than she let on. “Right behind you!” Amphitrite shouted in return. As they set off for the bay, the mersisters dove deeper, disturbing the seaweed that grew on the ocean floor, so it danced and waved at them like long green fingers. To keep from being swept away by currents caused by the girls’ passage, seahorses curled their cute little tails around strands of kelp and clung tight. A school of blue-and-orange parrotfish headed toward the mergirls, but then darted in another direction to avoid a collision. Halfway to the bay, the sisters passed a busy construction site where a school of guppies was working on a decorative wall mosaic, each pushing a bit of sparkly, colorful shell into place. When finished, one day this site would be a gift from all water-dwelling creatures to their favorite god. However, Amphitrite and Thetis were too anxious to pay much attention to what the guppies were doing as they propelled themselves through the water, pushing forward with strong strokes of their tailfins and arms. Soon they could see brighter bursts of sunlight dancing above them as the water became shallower. The bay was dead ahead. The surrounding sea was lighter here—the same pale turquoise color as Amphitrite’s hair. The water’s surface was smooth as glass, but in stormy weather it could become wild and unsafe. Huge craggy rocks of black granite lurked in this bay, anchored deep in its rippled white sand floor. During school field trips, the girls’ classes had explored numerous old shipwrecks, which these very rocks had caused in times past. Amphitrite trailed Thetis, slipping among the rocks to trace a familiar path through the bay. Merpeople had nicknamed them “sunning rocks.” With individual names like Oyster Rock and Diving Rock, each was well known to the Nereid family. Washed smooth by the constant crashing of waves when the tide rolled in each night, they were perfect for hanging out on a sunny day to comb your hair, sing, or read. You had to be careful not to sit on the rocks for too long, though. There were risks involved. For one thing, the principal of the school—their mom—gave demerits for being spotted by humans. Even worse, if you stayed out of saltwater for more than twenty-four hours at a stretch, you could become landsick or even die! Exactly what Amphitrite feared could happen to Halia if they didn’t find her soon. She kicked herself higher and lifted her head from the water for a few seconds in hopes of spotting their little sister. But she didn’t see the flash of Halia’s lavender scales anywhere on the nearby rocks. “Right. Okay,” said Thetis. She sounded as breathless as Amphitrite felt. Their bodies were practically jackknifing now with their eagerness to hurry. Finally, they reached the rock. With a mighty flip of their tails, both mergirls surfaced. Water streamed from them as each planted their palms wide on Anemone Rock’s slick, dark surface. With hard twists, they hoisted themselves out of the sea to sit upon it. It was still cold from the night, not yet warmed by the new light of the morning sun. “There!” said Thetis, pointing. Amphitrite shoved back her hair, turning to look. A short distance away, among sand dunes just back from the shore, she saw a glint of shiny lavender. The same color as Halia’s tail! “Halia!” called Amphitrite. A few last bubbles floated from her lips to sail high into the air. Pop! Pop! Pop! Now that they were out of the sea and could breathe air, their speech wouldn’t form bubbles any longer. She called out again, but there was no answer. It was dangerous to shout any louder. Mortals might hear them and come. “Legs from tail. Feet from fin. As her words died away, Thetis’s orange tail transformed into legs, and her scales shrank into a cute orange scallop-design dress called a chiton. She leaped to her feet, then scampered over the rocks toward the sand dunes. Easy peasy. As if walking were as simple as swimming. Ha! Since Amphitrite hadn’t yet gained the gift of shape-shifting, she had to remain behind. Like a fish out of water—or more like a mergirl out of water—she could only watch in frustration and crane her neck to keep her sister in sight. Sometimes she wondered if she would ever know what it was like to travel by land instead of by sea. Would she wind up like her mermortal mom, a half-mortal half-mermaid, who’d never acquired the ability to shape-shift? Luckily, although their mom lacked any magical abilities at all, she’d earned a high status in the mer community. As principal, she pretty much ran the school. Still, with all her heart, Amphitrite hoped she’d gain the power to shape-shift one day soon. Perhaps that was selfish, but she longed to see the world. As much as her dad would allow her to, anyway. In less than a minute, Thetis reached the spot where they’d seen the flash of lavender. Amphitrite hugged herself to calm her fears as she watched Thetis kneel in the tall dune grass. She appeared to be trying to wake up their little sister. If Halia had been there since yesterday, she’d have landsickness by now. But it hadn’t been anywhere near twenty-four hours since she’d left their watery home. So the case should be a mild one, right? Only why was Thetis taking so long? Growing more worried by the second, Amphitrite inched her way across the rock to try to get a better view. “Ow!” she yelped as she accidentally sat on a pebble. Scooching over, she saw it was actually a pink pearl. One that must’ve washed up onto the rock from an oyster shell during the night. She picked it up and examined it. “I wish you were a wishing pearl,” she told it. “Only, if you are, that wasn’t my actual wish,” she added quickly. There was an ancient legend among the merpeople that told of the existence of a special, enchanted strand of magical pearls that could grant your fondest wish as long as you possessed it. Plenty of mortal sailors and merpeeps had spent their whole lives looking for it. No one had found it, though. In fact, nobody knew if it really existed. Not to mention what it looked like. For instance, how long it was or what color the pearls were. Still, whenever she found a random pearl like this, Amphitrite always made a wish just in case it might have somehow come from that special strand. She stared hopefully at her sparkly golden tail for a few seconds. When nothing happened, her shoulders slumped. How disappointing! At least half of her sisters, including little ones like Halia and Erato, had already gotten the shifting gift. It didn’t seem fair that the ability to shift still eluded her. She could really use it right now! Amphitrite tossed the pearl into the bay. Plop! She gazed anxiously to where Thetis still kneeled. Although she was dying to know what was going on, she didn’t dare shout again for fear of attracting the notice of any mortals that might be out and about this early. If only she could be of some assistance. However, she had no choice but to watch helplessly as her twin sister picked Halia up and half-dragged, half-carried her over the dunes and back to Anemone Rock. “Landsickness,” Thetis diagnosed aloud, as soon as the sisters were reunited. That was obvious. Halia was breathing, but her skin was pale, lacking its usual healthy glow. Her eyes were shut and her head hung low, her arms limp. It was also obvious that their little sister had used a shifting spell to venture out of the sea. Her tail had transformed. She now had legs and wore an iridescent lavender chiton. “We’d better get her back into—” Amphitrite started to say. “Oh, barnacles!” Thetis hissed in an alarmed tone. “We’ve been spotted. If Mom hears about this, we’re dead.” What she really meant was, they’d get demerits. Amphitrite leaned around her sister, flashed a smile, and waved at the mortals. “Thanks, but we’re fine!” she shouted back. “Smile,” she urged Thetis. “Wave. Look happy.” That’s what their sunning arts teacher at MUMS had taught them to do in such situations. Thetis managed a bright smile as well and called out to them. “Just playing a game of, um, sea rescue!” She and Amphitrite began to coax Halia into the sea. Despite the danger they were in, both girls giggled. But they stiffened when a cute little mortal girl with the family pointed at Amphitrite, the only one of the sisters sporting a tail at the moment. “Look, Mommy. A mermaid!” the child piped up. Thetis stepped in front of Amphitrite to hide her from view, but it was too late. They’d been seen for what they were. With that, Thetis pushed Halia into the water and jumped in after her. Amphitrite shoved herself off the rock and joined them. Splash! Splash! Splash! Halia sank between Amphitrite and Thetis, still looking lifeless. Words bubbled from Thetis’s lips. She was chanting the reverse changing spell as the girls sank lower and lower. “Legs form tail. Feet form fin. Instantly, Thetis shape-shifted back into a mergirl with an orange tail. Relief filled Amphitrite as the chant also worked on Halia. Although her change came more slowly, within a minute their little sister’s lavender tail returned. She gave a small shiver. Her gray eyes blinked open. Then she grinned. They hugged her back, both giddy with relief. “You shouldn’t have wandered so far. It was dangerous,” Amphitrite scolded. Amphitrite and Thetis exchanged glances of frustrated amusement. Both knew that their scolding was useless. Their little sisters were growing up. Soon there would be no stopping them and their curiosity. When they began to venture onto land more and more often, the danger of them getting landsickness would increase. Honk! Through the watery distance ahead came the low moan of a foghorn. Long ago, their dad had scavenged the horn from an ancient shipwreck and brought it home for their mom. Now she used it to signal the beginning and end of classes at Mediterranean Undersea Middle School. “There’s the horn! C’mon, hurry. Shell studies is first period,” shouted Halia. With a happy swish of her lavender tail, she headed back in the direction they’d come, her landsickness totally a thing of the past. “Me,” blurted Amphitrite. Her eyes widened in surprise when the admission accidentally slipped out. “Since forever. I think it would be crazy exciting to get to travel around and see the landworld.” A little embarrassed now, Amphitrite gave a hard kick. Her silky turquoise hair fanned out behind her as she whooshed ahead of her sister. For Thetis and most of her sisters, the sea was enough. But the land would always draw some merfolk. Including Amphitrite. Her longing for excitement and travel was hopeless, though. And not just because she couldn’t shape-shift. Her sisters depended on her. She’d never leave them. Not unless some magical miracle occured that would keep them safe without her help. A spark of excitement leaped in Amphitrite at this news. The Temple Games were a weeklong contest of skill, strength, and strategy. Like just about everyone else, she’d read about them in Teen Scrollazine. She and her sisters eagerly devoured each new issue of the ’zine as it came out. If any merperson wound up on the winning team, they would bring great honor to the realm of the merpeople. And they’d be in the news! Just being chosen to be on a team would bring honor, Amphitrite thought. She’d love to be in the games. Then a sigh bubbled from her lips. Ha! Even if the rumors proved true, it wasn’t likely she’d be chosen. She, who couldn’t shape-shift. What use would she be to a team? No way would she ever be able to leave home and see the world. Instead, she would have to act all happy for those of her family who were chosen. And she would be happy for them. But, oh . . . if only she could go too!